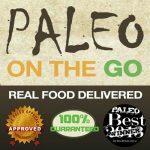 There are literally thousands of anecdotal stories into the benefit of the paleo autoimmune protocol (AIP) as a treatment for autoimmune disease. But until recently, there was no scientific research to back up these claims. That changed with the publication of this study. 15 patients with active IBD (Crohn's disease or ulcerative colitis) transitioned to the paleo autoimmune protocol. Result? 73% achieved remission. 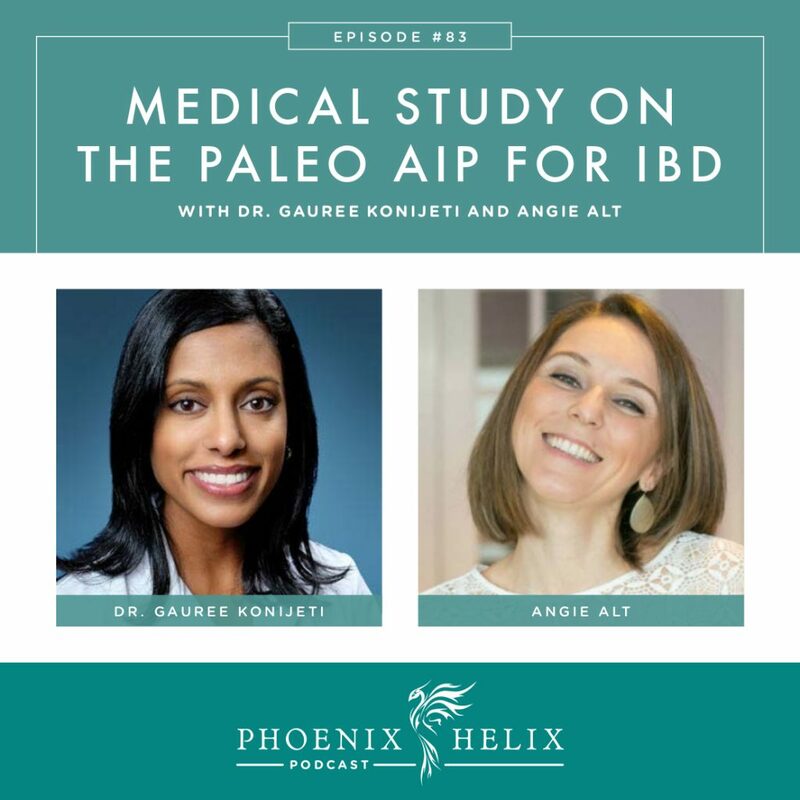 In this podcast, I interview Dr. Gauree Konijeti, gastroenterologist and lead researcher, and Angie Alt, the lead AIP coach for the group. Last chance to order AIP Thanksgiving Simplified. The last day to order is 11/14/17. Dr. Gauree Konijeti is the Director of the Inflammatory Bowel Disease Program Division of Gastroenterology at Scripps Clinic in La Jolla, California. It was a patient who introduced her to the paleo autoimmune protocol (AIP). He had severe ulcerative colitis that dramatically improved with AIP. A colonoscopy showed that his ulcers had completely healed. Dr. Konijeti has always had an interest in research. 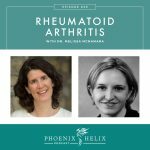 That same patient referred her to Autoimmune Wellness for more information, where she reached out to Angie Alt to collaborate on a medical study. 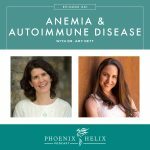 Angie Alt is the author of The Alternative Autoimmune Cookbook and co-author of The Autoimmune Wellness Handbook. She has taught the AIP to over 1,500 people through her online group coaching program: SAD to AIP in SIX. She led a similar class for the group involved in this medical study. To learn more about Angie, you can listen to her personal healing story in episode 1 of this podcast. IBD stands for Inflammatory Bowel Disease. It's a category of autoimmune disease, and there are 2 types: Crohn's disease and ulcerative colitis (UC). Ulcerative colitis is isolated to the colon and only attacks the mucosal layer. Crohn's disease can affect the entire GI tract, and attacks multiple layers. The most common symptoms for both are abdominal pain, diarrhea, and rectal bleeding. Other symptoms include weight loss and vitamin deficiencies. The gold standard for diagnosis is a endoscopy/colonoscopy, but a complete health history and ruling out infections that can mimic IBD are important, too. In conventional medicine, they are often treated with similar medications. TNFa-inhibitors are systemic immunosuppressants used with many autoimmune diseases. Anti-integrins are designed to stop inflammatory cells from reaching the gut. But there are some new medications being approved for just one or the other, for differentiated treatment. IBS (which is often confused with IBD) stands for Irritable Bowel Syndrome, which is a collection of symptoms which can coincide with IBD but also exists outside of that diagnosis. In this study, the patients had IBD specifically. Common IBS symptoms include abdominal pain, constipation, bloating and diarrhea, but not usually bleeding. Your general physician can order a calprotectin stool test and a CRP blood test, both of which track inflammation in the body and can help differentiate between IBD and IBS. 15 patients participated: 9 with Crohn's; 6 with UC. They all had active IBD, validated through endoscopy/colonoscopy. Average disease duration was 20 years. Most were on medication, but the drugs weren't achieving remission. The patients continued their medication during the study, doing the AIP as a complementary treatment. Angie led them through a transition diet modeled after her program SAD to AIP in SIX. This was followed by a 5 week maintenance program (after they had fully transitioned to AIP). To measure outcomes, they did follow-up endoscopies/colonoscopies. They also tracked inflammation markers through blood and stool tests, as well as quality-of-life surveys. Results: 73% achieved clinical remission. They also gathered information related to microbiome changes and gene expression, and they're analyzing that data now. 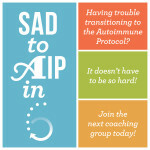 In addition to Angie, the SAD to AIP coaching team includes 3 other health & nutrition coaches. For this study they added one additional team member: Registered Dietitian, Amy Kubal. They created special recommendations for anyone in the group who was currently in an IBD flare: (1) well cooked vegetables instead of raw, (2) smaller portion sizes of vegetables, (3) lean, skinless meats rather than fatty meats, (4) prioritizing soups and stews which are easy to digest, (5) choosing avocado and olive oil rather than satured fats, and (5) avoiding coconut products. Note: These recommendations are specifically to address the diarrhea common during IBD flares; they aren't typical AIP recommendations for everyone with autoimmune disease. As people with IBD begin to heal, they slowly transition off these recommendations. Angie wasn't surprised at the 73% remission rate. After working with thousands of people, she'd seen enough success to anticipate positive results, but it was very validating to have a scientific study capture this effect. This medical study is part of a growing body of research showing the potential benefit of dietary interventions for IBD. Her fellow gastroenterologists are very interested, but don't know how to integrate this knowledge into their practice. Appointment times are short, resources are limited, and patients would need skilled education and support. Ideally, there would be a dietitian on staff trained in the protocol, who could then train the patients. Angie recently helped develop an AIP Certified Coach program. The book, Unconventional Medicine by Chris Kresser, provides a template for a collaborative practice model. An anti-inflammatory diet as treatment for inflammatory bowel disease: a case series report. Low-FODMAP diet reduces irritable bowel symptoms in patients with inflammatory bowel disease. She's in conversation with Scripps Clinic, where she leads their IBD program. She would like to expand to an integrative medicine model that addresses diet and lifestyle in addition to standard medical therapies. Not only does she believe this is the best way to help patients, but it would also provide the infrastructure to complete ongoing research. She would love to do larger studies involving more patients. She would also like to isolate factors to see which part of the AIP is the most influential in remission. And she's also interested in whether the diet can replace medication in some cases. There are lots of avenues to explore. Dr. Gauree Konijeti is accepting new patients at Scripps Clinic in La Jolla, CA. When you call, ask for her scheduler, Natisha. You can keep up with Angie Alt's work through her website Autoimmune Wellness.